Lab Notes is the blog of MAD Creative, a brand and design firm in Kansas City. Content includes brand reviews, design news, interviews, best business practices, great work. Lab Notes authors are MAD Creative owners Stacy Downs and Gentry Mullen. Once we got signoff on the logo design, we started developing color palettes. Rosin Preservation’s original color scheme was light blue paired with deep brown. In thinking through the update, we knew we wanted the color statement to be serious but not too corporate, and we wanted to extend the graphic personality of the logo styling, and express the personality and desires of the client. A selection of graphic designs that inspired us as we developed a color statement for Rosin Preservation. Inspiration can come from anywhere. With its Deco vibe, we looked to 30s, 40s and 50s-era inspiration including book covers, travel posters, matchbooks and similar ephemera for color schemes. During this process our client showed us a picture from one of her projects that she loved, in particular noting the teal color on the door. One thing to remember is that color is not static and never exists by itself. How we perceive any single hue is forever influenced by its relationship to the other colors that are inevitably around it. We saw the teal, but also its relationship to the rusted steel frame surrounding it, the bluish-grey graffiti on top of it and the bricks and mortar adjacent to it. The client's photo that led us to our final solution. This was precisely the inspiration we needed. Sampling directly from the photo generated a selection of colors that we then saturated and finessed into the the result you see above. By using colors that were inspired by historic building materials, and the patina they acquire over the years, we were able to develop a color scheme that feels modern, is visually pleasing and—importantly!—has purpose. The icing on the cake? The client is thrilled! In our effort to keep these posts brief, we’ll talk about typography and share business cards and letterhead next week. We don’t think of the firms we work with so much as “customers” or “clients” as we do partners. Why make the distinction? Because one of our core beliefs is that our successes are linked. Our wins are mutually beneficial. When they score, we score. When we’re successful, they are, too. One partner that we’ve had the privilege to work with, Rosin Preservation, took a big step not long ago when they bought and rehabbed their own building. Concurrently they hired us to manage a brand uplift, including a new graphic identity, a new website, print and digital outreach, and public relations. The happy result? Extensive media coverage, several awards, increased online traffic and robust lead generation! Over the next several weeks we’re going to walk through that project, addressing the challenges, the problem solving and the process behind each step, and its impact. We have a lot to share and insights that we're certain our readers will benefit from. We hope you enjoy the journey! MAD Creative had the honor of helping plan Kansas City Design Week. It’s a fall-to-spring task — as long as a school year, with most of the summer off. The annual celebration, now in its seventh year, is worth all the time and effort because it shines light on the area’s remarkable talent pool. And there are always a handful of speakers who truly inspire. Shaping one of the week’s most ambitious events was an especially rewarding challenge. MAD Creative helped choose five modern houses that Kansas City Design Week opened for the Homes By Architects Tour. The event took place on a beautiful spring Saturday in Roanoke, West Plaza and Mission Hills. Architects from DRAW Architecture + Urban Design, GastingerWalker&, Hufft Projects, RDM Architecture and Wendlandt & Stallbaumer Architects talked to guests about design philosophy, client needs and construction details on the self-guided tour. The gorgeous architecture demanded a gorgeous identity for the tour itself, so we created simple, elegant signs and a booklet of striking photographs to tell the stories of each home. What we love most about design is that it informs and delights — and occasionally, surprises. An architect we worked with on the tour said she was surprised by our design. At first glance, the linework on each of the booklet pages appears to be just that — lines. The architect: “They’re the rooflines of each of the houses!” Us: Happy dance. We danced again when the April cover story of Spaces magazine featured a tour home that previewed the event. This inaugural tour succeeded on a macro level, too. It sold out. And by design, we’ll be repeating it next year. The American Institute of Architects Kansas City hired us to reboot its annual officer election event to entice more members into participating. We felt honored and up to the task because we believe in the power of the profession. Architects shape the world — Kansas City included — into inspiring places to live. We wanted to dream BIG like them. We brainstormed the theme of BIG in our initial conversation with AIA Kansas City and crafted a new identity around that: AIA KC BIG NIGHT. BIG implies heft and lots of possibilities. For the event logo we settled on a typographic solution that we felt the intended audience would fully embrace: the simple, beautifully proportioned typeface Gotham set in a way that playfully explores positive/negative space while generating a Bright Lights, BIG City vibe. The subject line for the Save the Date heralded “Something BIG is about to happen!” The invitation contained lots of BIG wording. We created BIG stuff for the event. There was a significant bump in attendance from previous years and a renewed sense of enthusiasm for the institute. BIG win! 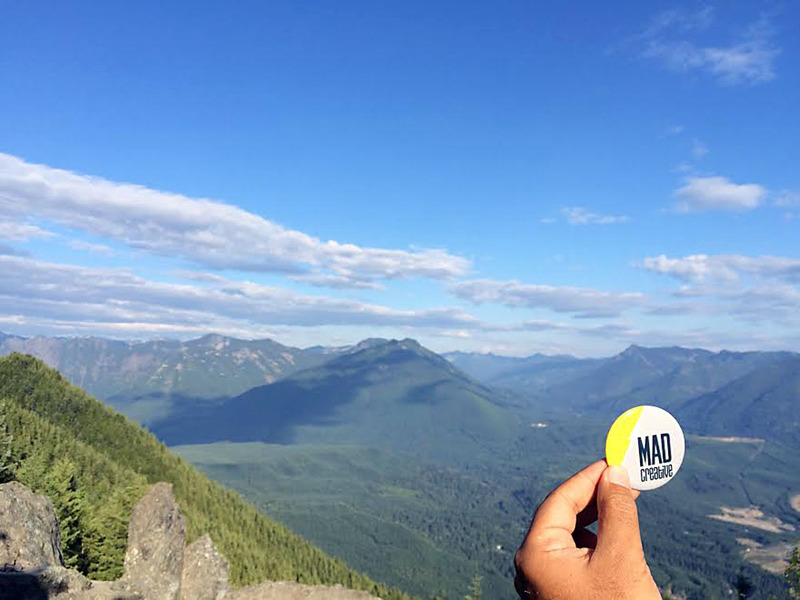 First MAD on the Moon — and 10 Other Awesome Summer Sitings! What a MAD summer it’s been! Let us count just a few of the ways. 1. We explored the mysteries of space via central Kansas. 2. We witnessed naturally icy blue glaciers in Alaska. 3. We rode to the top of the Space Needle. 4. We summited Mount Si in Washington. 5. We watched whales in the wild and in aquariums. 6. We studied miniature brick universes in San Diego. 7. 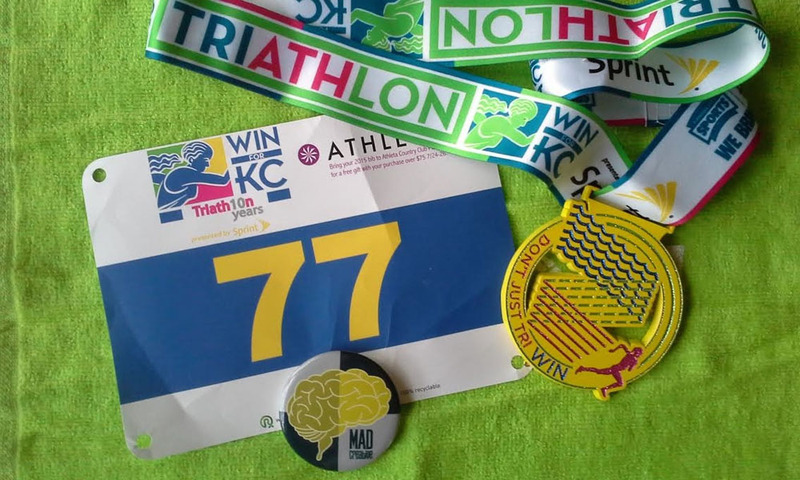 We swam 547 yards, biked 10 miles and ran 3 more in Kansas City. 8. We had a Coke and a smile at the headquarters in Hot-lanta and caught a ball game. 9. We recharged in the sauna at a Finnish summer house. 10. We played on sandy beaches east and west. We’re already counting the days until the end of the school year in 2016 so we can explore this beautiful MAD world — uninterrupted — once again! Stickers, pin-backed buttons, rubber stamps and getting letters in the mail… So many of the simple pleasures we loved in grade school are still just as much fun for us today. That — and our never-ending quest to be our own best client — was all the reason we needed to create MAD stickers and buttons for ourselves. Want some? We’re happy to share. All you have to do is ask! Send us an email — be sure and include your mailing address — and we’ll ship some your way. Pin them to your kid’s backpack or your favorite baseball cap, or stick them on your luggage during summer vacation. In return, all we ask is that you email a pic showing how you went MAD. We’re eager to see how far, how wide and how creatively our readers can spread the MADness! Act quickly, because when they’re gone, they’re gone! Sounds fun! Send me MAD Swag! If there were a game show called “Stump the Designer,” creating the perfect business email signature would definitely be the final round. So many colors, so many fonts and so many social media icons add up to so many details that can easily make you — and the company you represent — look less like a professional and more like a love-struck high schooler. Keep in mind the purpose of an email signature: It elevates your brand by providing the best ways to communicate with you at your place of employment. MAD Creative aims to win “Stump the Designer” and show you how to claim email sig victory. Fax numbers. These really date your business. Faxes are still used once in a while but not enough to warrant real estate in your sig. Phone brand. If you use your mobile to write company email, go to your settings to change the default sig that advertises what type of phone you’re using. Add your company email signature instead. Contact information. Include your direct phone number and mobile line if it’s applicable. Include a link to your website, your company’s 24-7 brand advocate. It’s good to include your actual email address with a link because it can reinforce your company’s web address and be clicked on to begin a clean email string. In some instances — if you own a store — it’s also helpful to include your physical address. Readability and style. Think of email signatures like a classic business suit. Stick to black, blue and gray and you won’t go wrong because in typeface they are the most readable colors. Use a sans serif font (Helvetica or Arial, never Comic Sans!) in a size from 9 to 12 points. We like using a horizontal signature with pipes separating contact points. Then when it stacks vertically on mobile viewing, it looks organized and professional. Legality. It’s sometimes important to include a disclaimer with an email signature. If your company is updating its signature, make sure you have a disclaimer if you need it, but make it a point or two smaller than your contact information. Consistency. Make sure your team is using the same type of signature. It gives your customers confidence that you’re communicating effectively with them since you’re communicating effectively with each other. Millions of people are fans of Ina Garten, known for her “Barefoot Contessa” Food Network show and cookbooks. Audiences adore her because she makes entertaining seem easy and approachable. How does she make hosting a sophisticated dinner party look so simple? By sharing useful information like a coveted friend who has the scoop on all the secret sources in town. Her advice on cooking (add coffee to chocolate desserts to make them more chocolate-y) and decorating (use monochromatic blooms to create a harmonious floral arrangement) will never steer you wrong. So when Garten spoke about entrepreneurism in the University of Missouri-Kansas City’s “Ideas of March” series, the at-capacity crowd knew they were in for a treat. Indeed; now that it’s April, Garten’s words continue to inspire. Instead of delivering a presentation, which is essentially what Garten does with each episode of her cooking show, she held a conversation on stage with Kansas City food writer and philanthropist Mary Bloch. “If you love it, you’ll be really good at it,” Garten said of entering the business world. While working as a policy analyst in 1978 in the White House Office of Management and Budget, Garten felt creatively unfulfilled. She spotted a New York Times ad for a gourmet shop in the Hamptons called “Barefoot Contessa.” Although she had a passion for food and entertaining, she’d never run a business before. “You can always stand on the side of a pond and find a million reasons not to jump in,” she said. Intrigued, she made a low offer and was surprised it was accepted. Garten said learning from role models is critical. Hers were Julia Child and her love for French cuisine, and Eli Zabar with his Manhattan food empire. Garten built up the “Barefoot Contessa” store and sold it to two employees in 1996. She began writing cookbooks that became bestsellers, leading to her own Food Network television show in 2002 — this is when she really became famous. Garten’s shows feel authentic because she has her real friends over for meals and parties. Many of the episodes feature her husband, Jeffrey, who as a Yale international business professor, is no slouch himself. Garten declines offers to launch a magazine and endorse products because she “wants a life” and intends to protect the business she has built. She initially turned down the television series, too, but producers kept nudging. That willingness to let yourself go outside of your comfort zone, she said, can be the key to bigger and better opportunities. You hear about people roadtripping to catch a concert or a sporting event. But a lecture by a graphic designer? Never! Jessica Hische demands the exception. 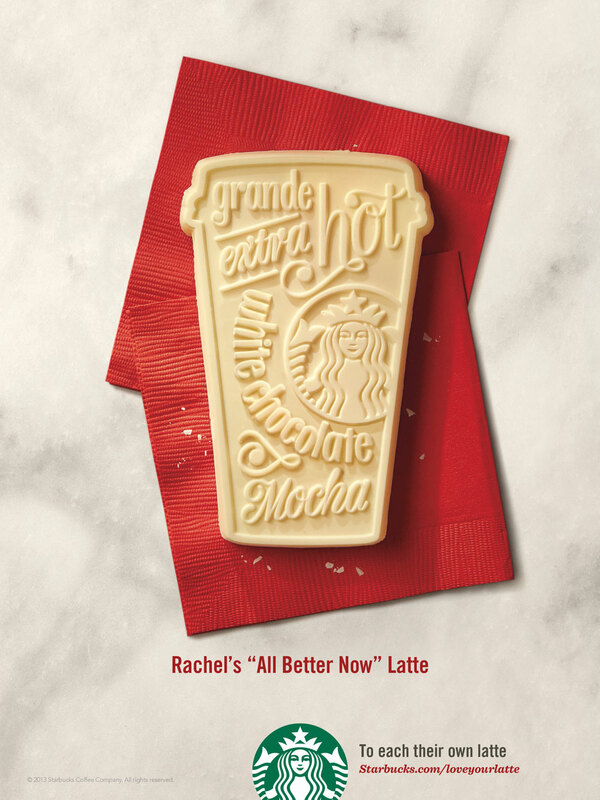 A rock star in the design world, she belts out brand work for big-time clients including Starbucks, MailChimp and director Wes Anderson. So when I saw that she’d be speaking to AIGA in Omaha, I bought a ticket and gleefully made the three-hour trek, never mind the forecasted three to seven inches of snow. Hische’s name topped the marquee of Omaha’s Waiting Room Lounge, fittingly, a music venue. Seven months pregnant, she explained that the sold-out show would be her last speaking engagement for a while. Hische is a letterer, not to be confused with a calligrapher who uses a pen or brush to create typographic flourishes. A letterer draws letters. 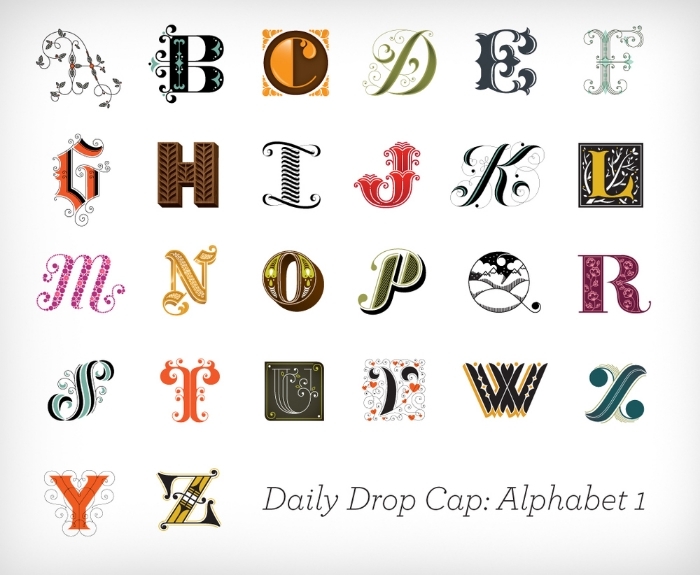 Her breakout hit was Daily Drop Cap, a blog she started in 2009 featuring all 26 letters in the alphabet, drawn one by one over a dozen rounds. As fascinated as I am by these elaborately illustrated letters — especially the scrolling snake of an “S” — it is Hische’s informative and passionate explanations about design that delight me. Her “Should I work for free?” flow chart (surprisingly, sometimes the answer is yes) is required reading. Hische’s talk in Omaha, “Remember the Analog,” centered on her creative process for clients. Like most of us, she’s tethered to the digital world through social media and email. But doing one’s finest work requires unplugging. “The best time is no-computer time,” she said. Her design work is characterized by impeccable style backed with substance. To achieve that she does a lot of research. A LOT of research! When she collaborated with Penguin Books on a series of 26 drop-cap book covers, she spent a year and a half reading the books. Through that discovery process, characters in the classic books informed the letters. Brainstorming also is an important step. Hische opened up her sketchbooks to show lists of word associations that inspired her drawings. When it’s time to present concepts to a client, Hische advises to always play your A game — easier said than done in this expect-it-yesterday world. After one client complained that she sent jpegs of sketches, she began taking the time to send PDFs with explanations of her thought process captioning her designs. Hische’s hour-and-a-half talk felt like 5 minutes. I wanted the crowd to clap for an encore to bring her back for more. They didn’t, but no matter. Hische had already given us plenty to think about for the long drive home.